We now have an online store where you can get safe products and also have monthly shipments of medication such as Flea and Tick prevention and Heartworm prevention. Pet Emergency? Call us right away at (563) 382-1806! If you live in Decorah or the surrounding area and need a trusted veterinarian to care for your pets – look no further. Dr. Merill Guarneri is a licensed IA veterinarian, treating all types of pets. Your pets’ health and wellbeing are very important to us, and we take every possible measure to give your animals the care they deserve. Critters & Such Pet Care is a full-service animal hospital and welcomes both emergency treatment cases as well as pet patients in need of routine medical, surgical, and dental care. Dr. Merill Guarneri has years of experience treating serious conditions and offering regular pet wellness care. Beyond first-rate pet care, we make our clinic comfortable, kid-friendly, and calm, so your pet can relax in the waiting room and look forward to meeting our Decorah veterinarian. We are happy to offer a number of resources that enable you to learn about how to take better care of your pets. Please feel free to browse our site, particularly the informational articles. The best veterinary care for animals is ongoing nutrition and problem prevention, so becoming knowledgeable about preventative pet care is essential to the ongoing success of your animal’s health. If you have any questions, call (563) 382-1806 or email us and we'll promptly get back to you. Our Decorah veterinarian office is very easy to get to -- just check out the map below! We also welcome you to subscribe to our newsletter, which is created especially for Decorah pet owners. At Critters & Such Pet Care, we treat your pets like the valued family members they are. My name is Kenzie Meyer; I graduated from North Fayette Valley in 2014 and graduated from college in May of 2017 at NICC with my Veterinary Technician Degree. I grew up around West Union my whole life and currently live in Saint Lucas, IA with my husband Justin Meyer and my four legged children. My dog Jaycee, with my two cats Ryan and Ralphie, and my chinchilla Mr. Fluffy. Dr. Merill is a 1994 graduate of Iowa State University College of Veterinary Medicine. She started her career in Elkader/Strawberry Point providing small animal care in a mixed animal practice. Very shortly after graduation, she opened her own veterinary clinic in Strawberry Point and had her first child. In 2001, she moved up to the Ossian area and worked at the Ossian Veterinary Clinic in Ossian and Valley Veterinary Clinic in Elgin. 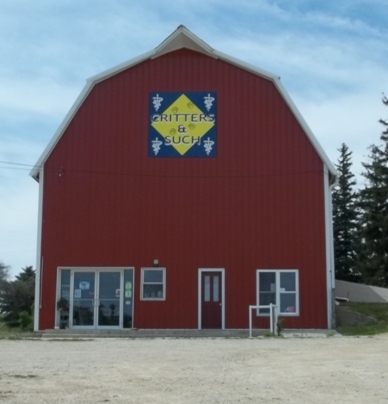 In 2006, she opened Critters & Such Pet Care in Decorah and moved to the current location in 2012. Dr. Merill has been married to her husband, Michael, since 2007. She has 3 children, two daughters, Domenic and Mahogani and one son, Kaelan. The family has 2 dogs, Rogue and Xavier and ten cats. Dr. Merill also has 2 grandkittens and 1 granddoggo. Alicia joined the practice in 2013 as a veterinary assistant. She graduated from Decorah High School. in 2005 and graduated from Kirkwood in 2007 with an AAS degree. She currently resides in Ridgeway with her significant other, John and 3 pitbulls, Lola, Cyrus and Squats. Alicia enjoys dog training. My name is Steph Bessler. I graduated from NICC in 2014 with my Veterinary Technician degree. I grew up in Cresco, IA and currently live in Protivin, IA with my husband, Stuart, our daughter Evie, and our two dogs Auora and Foxy. We adopted Foxy the week before Christmas 2018.
has had many issues during the past eight years - Everyone there has treated Molly like one of their own and I appreciate all of their help and concern. "I've been bringing my pets here for several years now and have always had my animals very well taken care of. Staff is friendly and helpful. I would recommend Critters and Such to anyone looking for pet care"
"We love Critters and Such Pet Care. Thanks to the staff for loving and caring for our own pets as much as we do!" "I want to say thank you to all the staff for taking such good care of my Pot Belly Pig.. Zena Lee when she came to you for her spay and vaccinations and all on Monday January 26, 2015. I was a very nervous piggy momma due to the concerns and lack of knowledge available for dealing with the pot belly. All other vets I contacted wanted nothing to do with it, and you did your research and kept my baby safe. Zena also says thank you for the great care she was in while visiting you. We will be back!!!!"